Prime objective of this lecture is to presentation on Types of Advertising. Here explain Advertising in International Business perspective. 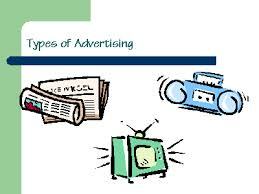 Advertising is paid type of nonpersonal communication about a company, goods, service, or thought by an identified sponsor. Institutional Advertisements is made to build goodwill or a photo for an organization, in lieu of promote a specific good or service. Cooperative Advertising is usually an advertising programs by which a manufacturer pays a portion of the retailer’s local advertising expense to promote the manufacturer’s products.